The BONSAI URN is the eco-friendly portable cremation urn which gives you a new option to honor your loved ones cremated remains with growing memories. This beautiful porcelain ceramic cremation urn utilizes our patented growing system that allows you to grow this lovely Traditional Windswept Juniper Bonsai Tree. The roots will slowly grow into the cremated remains, adding sustenance to the environment and your loving memories. 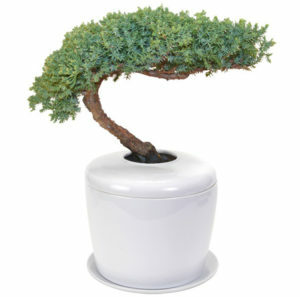 The Bonsai Urn is eco-friendly and is designed to store the cremains of people and pets. This dwarf Juniper from Japan is the most popular evergreen in the U.S. When we think of a traditional bonsai and what it should look like, we think of a “Juniper Procumbens Nana.” It is very hardy, long-lived, and tolerates many adverse conditions. Approximately 8 to 10 years old, 11″ – 12″ tall. Grows best Outdoors.